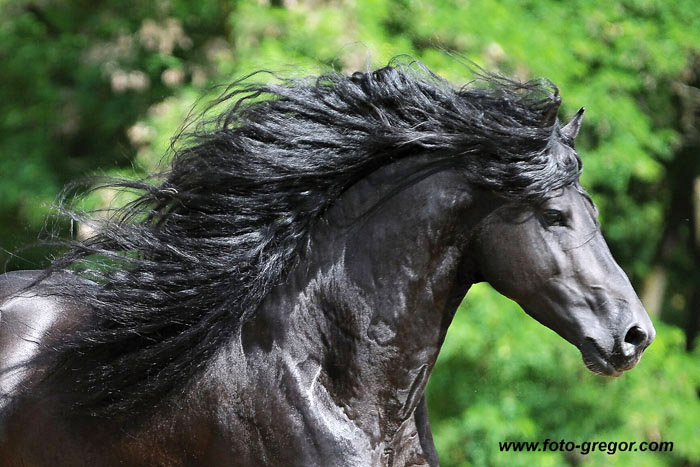 The original and traditional Friesian horse breeding area is Friesland in the north of Netherlands. 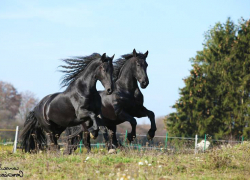 Although Friesians are a very old breed, they nearly became extinct. They were even known before Christ and were usually used in wars. 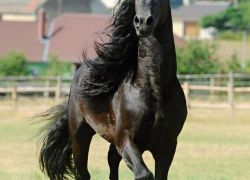 There are some mentions of presence of Friesian horses in northern England and in Scotland from around 150 AD. 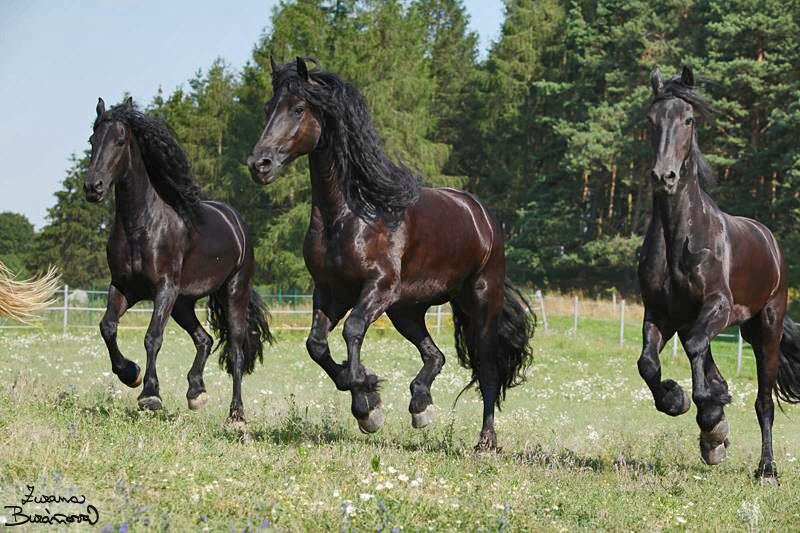 English writer Anthony Dent described them as “ancient English black horses”, similar to Shire horse or Fellpony. 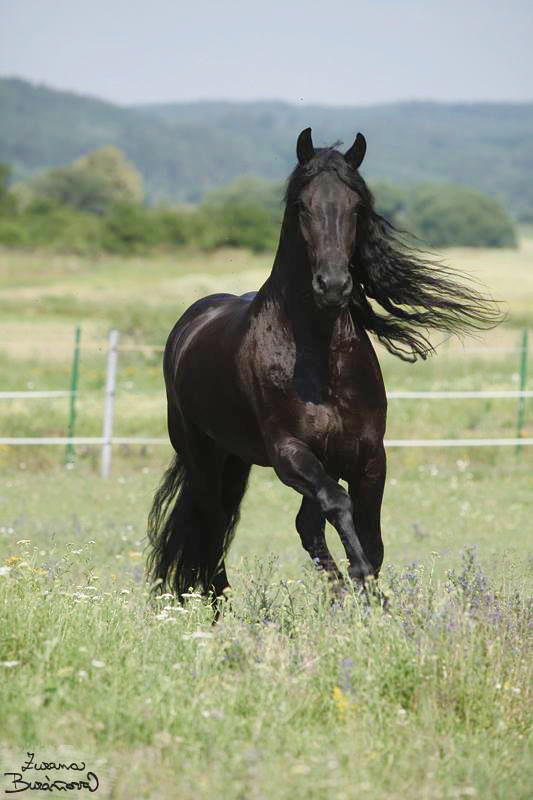 The first written designation “Friesian horse” dates back to 1544. They were still popular as war horses, some warriors could be even easily identified from distance by their black steeds. 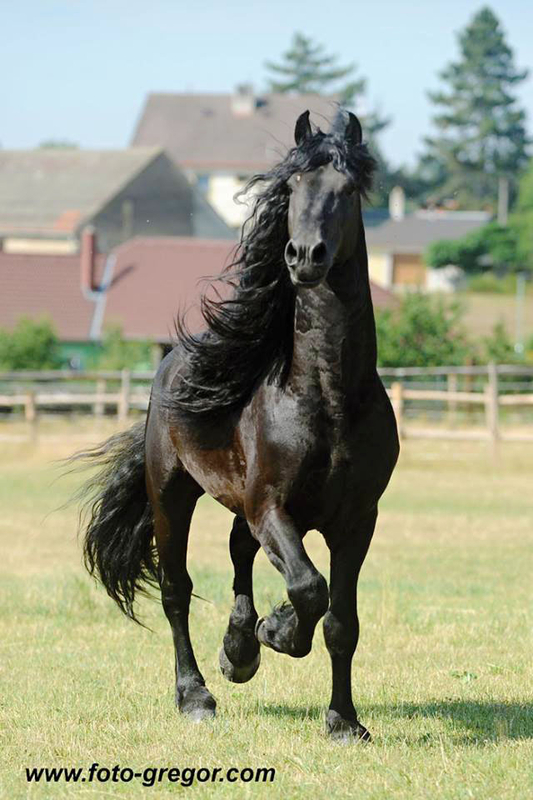 In the 17th century Friesians were, together with Spanish horses, mostly used for high dressage. Consequently they became popular as horses in harness like e.g. Czech Kladrubers. 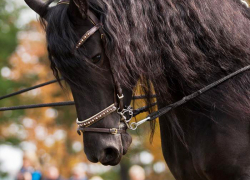 During 18th and 19th centuries Friesians concentrated only to Friesland. Every Sunday rich farmers used to go to the church in typical two-wheel carriages, gigs, drawn by a couple of Friesian horses. 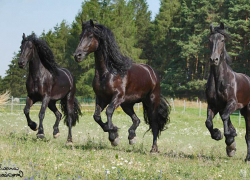 Serious crisis in Friesian horse breeding came at the end of 19th century. 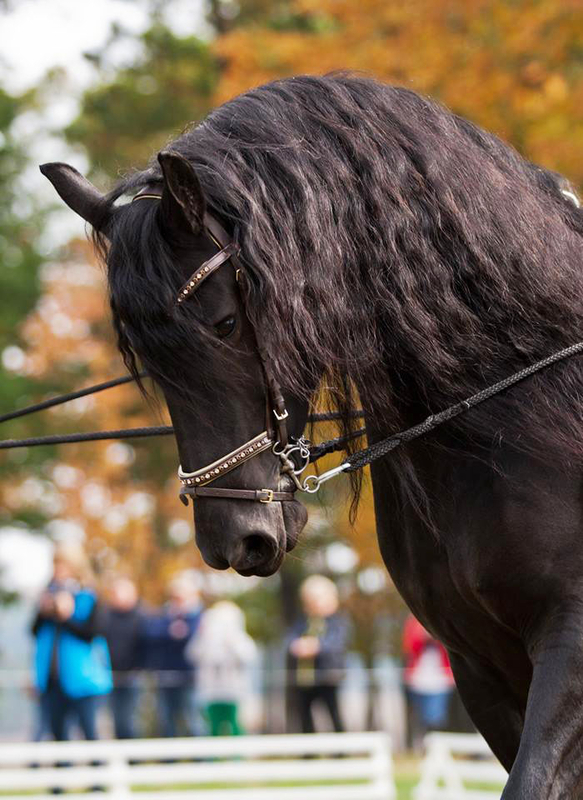 Need for heavy breeds for agriculture pushed the lighter Friesians out of popularity. Farmers crossbred their graceful black pearls with heavy coldblood breeds. Heavy, but not very good-looking horses were created. Fortunatelly, on 1st May 1897 a group of enthusiasts met in a pub De Drie Romers in the Friesian town Roordahuizum and established a famous breeding book – “Het Friesch Paarden Stamboek”. Unfortunately it seemed almost impossible to revitalize the Friesian horse. The influence of coldblood horses was too strong and the pure breeding lines were disappearing. In 1913 only three older breeding stallions remained. 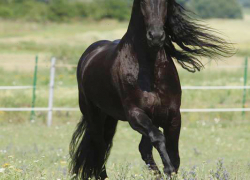 They finally created three main breeding lines from which all present modern Friesian horses come. Although the situation looked catastrophic, finally, like magic, the Friesian breed was saved. A great deal on their saving had the horses themselves – especially their amazing character, adaptability, intelligence, friendly nature and enormous dilligence. 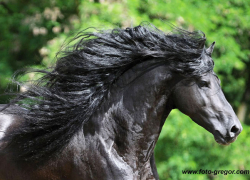 At all times the breeders followed the following main conditions: Friesian horse must be black, have a long rich mane and tail, and have hair on lower legs. That is why they are unmistakable to other breeds. 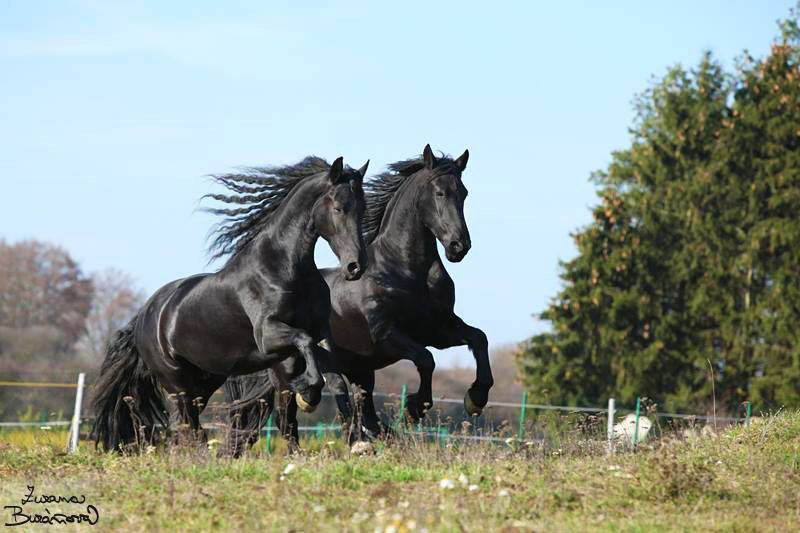 Around 1960 there was another crisis in Friesian horse breeding – mechanization in agriculture pushed Friesian horses out of fields and became redundant. In 1965 only 500 mares were registered in the Stamboek. But Friesians again demonstrated their incredible adaptability. From the field horses they almost immediately turned into horses for leisure time and entertainment.